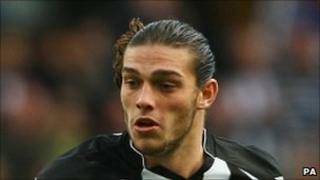 Newcastle United striker Andy Carroll has had a charge of assaulting his former girlfriend dropped. He appeared in court accused of attacking Laurie Henderson at her home in Northumberland on 17 October. The hearing was adjourned until January with an initial bail condition that he lived with club captain Kevin Nolan. But the Crown Prosecution Service said after it reviewed the evidence it had decided there was not a realistic chance of conviction. A CPS spokesman said: "We take all cases such as this extremely seriously and we considered the evidence initially provided by the police and decided the correct charge was one of assault by beating. "We have a duty to keep cases under constant review and once we received a full file of evidence before the trial we looked at the case again. "Having reviewed all the evidence now available, we have decided there is no longer a realistic prospect of conviction and we are no longer proceeding with the case against Andrew Carroll." He said a letter had been sent to Miss Henderson to explain the decision. Three days after the court had ordered Mr Carroll to live with his captain, his car was targeted in an arson attack outside Mr Nolan's Northumberland home. In October, the player pleaded guilty to a separate assault charge after an incident at a Newcastle nightclub and was fined £1,000.